Steve Gibson has developed into one of the most sought-after custom painting and fine art artists in the USA. His company “Air, Oil and Lead“ stands for everything his artwork is known for, namely airbrushing, oil painting, and lead pencil work. Steve Gibson’s method is that of an old master of oil paint work. This includes beginning his work by first establishing an underlying gray hue (known as Grisaille) so as to immediately create light-dark areas for structures. He follows that up by applying color with paint mixtures based on CMYK colors (cyan, magenta, yellow, black, etc.). 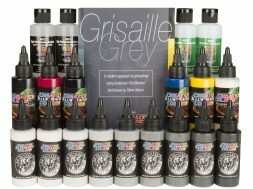 Based on this technology, Createx has brought out the Air, Oil, Lead Grisaille Set. 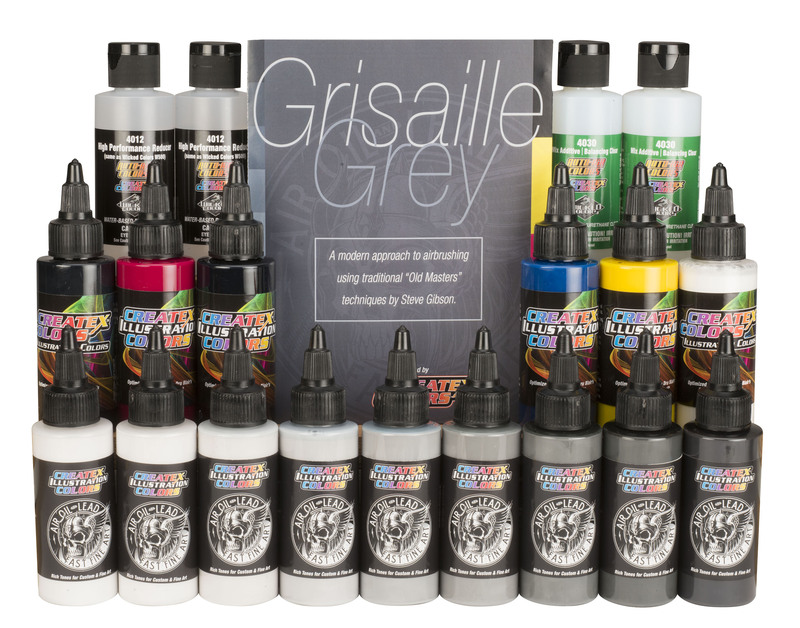 This set includes 15 color hues à 60 ml, including 9 gray hues and the CMYK tones for colorization. Reducer and transparent base are also found in the set for diluting purposes. The set also comes with an instruction manual from Steve Gibson himself to help you properly work with his techniques. This set is available in specialty airbrush shops for 220.25 EUR / 162 USD (RRP).